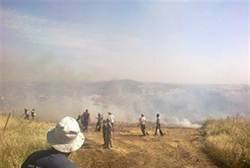 Arabs set fire to fields outside the Samaria (Shomron) community of Yitzhar on Saturday. Fire crews that arrived at the spot were pelted with rocks. One of the Arabs pulled out a knife and was shot in the stomach by a member of Yitzhar’s emergency readiness squad. The IDF fired tear gas to disperse the violent Arab crowd. Arabs and the pro-Arab group B’tselem claim that the Arabs were in fact trying to put out the fires, which had been set by Jews from Yitzhar. The Arabs insist that this is what happened, even though Jews are forbidden to light fires on Sabbath. Mesika said that B’tselem’s video edited out the scene in which the terrorist pulled out his knife, showing only the Yitzhar squad’s response. He demanded that the IDF issue administrative orders distancing extreme leftist activists from Judea and Samaria.